The 21st Century must be a time of creating bridges that span the ancient gap between art and science. Imagine a work of art that teaches… or a teaching tool that inspires and dramatically expands our horizons! Outward, to far galaxies… or inward, to the very molecules that make life tick… while always pondering the other. The weirdly different and fascinatingly strange. 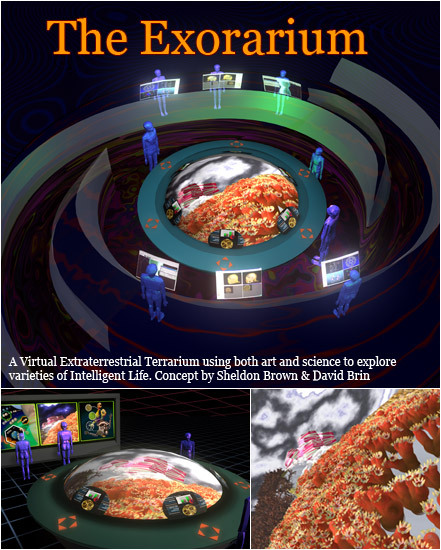 The Exorarium concept has been developed by astronomer and best-selling science fiction author David Brin in tandem with renowned tech-artist Sheldon Brown, whose audio-visual exhibits can be found in locales such as the Seattle Center and the San Diego Science Museum. Now, early conceptualizations are ready to be shared here at this development site. We are still at an early stage, so comments and suggestions are welcome. Feel free to explore the vivid concepts and let us know what you think.